Often inspiration comes from nature, or the beauty of life. At times it is from the diversity that surrounds us. Earthen Child is that blend of life and nature. My main inspiration comes from the work that I do as a humanitarian ambassador, for children and families in third world and war torn counties. 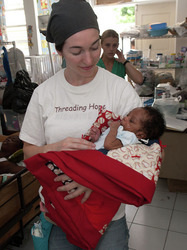 I work mainly within orphanages and pediatrics units in hospitals. The gift those children give me is the ability to smile and find hope, in some of life's darkest corners. Through Highwire and Threading Hope I am able to bring art and warmth to those children who warm my spirit, and give creative life to their vision of the world around them. My last trip was to Haiti, and within months of my return sketches started to formulate and it was the beginning of Earthen Child. I wanted our product to be affordable, top of the line, safe and natural, unique and imagination inspiring for the children and parents that gravitate to an eco-friendly - global experience of raising their children. Thank you for your interest in Earthen Child, it is the parents and children all around that world that are an inspiration for this company...so truly thank you for all you do, to raise amazing little ones. dl-couture - a globally conscious couture clothing company. Wednesday Wedding - offering custom wedding gowns, with limited editions, for dreams to come true.